Copy-paste is a basic action performed by almost all of us who use systems in our daily life. Not only is it a time-saving process but also helps us to boost the productivity. 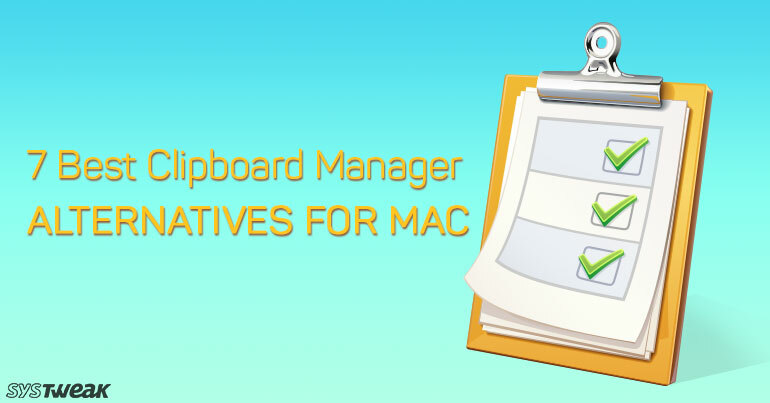 However, using the default Mac clipboard comes with a few limitations like any other default program which can be overcome by using alternatives to it. In this post, we’ve prepared a list of the 7 best clipboard manager alternatives for Mac. PasteBox is a lightweight and powerful application that helps copy paste content on daily basis to smoothen workflow and enhance productivity. The app has been trusted by dozens of Mac users and developed by Aleksandar Stevic. It is five stars rated the app. It lets you save numerous clipboard types, be it plain text or an image. It is a fantastic app that not only fixes bugs but also enhances your performance. PasteBox is capable of keeping your copied data from clipboard and lets you access the data through a shortcut. CopyClip is a phenomenal app and useful for Mac users. It is capable of saving all the copied, cut and paste data and rapidly suggest the snippet of text you’ve been looking for. It is a free app and developed by FIPLAB Ltd. With CopyClip, you can take control of copy and paste. It is a valuable time saver application, which is suitable for everyone to handle their workflow. It is easy to use Clipboard Manager that automatically saves everything you copy. You can easily copy, paste, edit, view, and share your content with others. Copy’em Paste is a simple yet powerful clipboard manager for turbocharging your daily workflow. It is a reliable app that records your entire clipboard history of image, text, screenshots, and links. With Copy’em Paste, you can get an instant access to clippings via the menu bar or customizable command-shift-v.
You can store unlimited clippings in almost all the formats such as text, images, PDFs, links, files, HTML and much more. It provides tons of rich features such as sort clippings by drag-and-drop, most-recently-used dates, creation dates, and paste frequency, etc. ClipMenu is one of the best clipboard manager alternatives that offers tons of incredible features for its users. It allows you to record 8 clipboard types, from plain text to image. To deal with the daily workflow, you can register texts you often use such as user ID’s, e-mail addresses, as snippets. The app can manage re-usable text as snippet. The app allows you to record clipboard history in Rich Text Format (RTF), Rich Text Format Directory (RTFD), URL, PDF, Plain text, TIFF & PICT clipboard types. If you have adequate memory space on your Mac, then you can adjust unlimited clipboard history items free of cost. However, the default value is 20. With iClipboard, you get a polished interface and class-leading features that help you to perform regular copy & paste commands effectively on Mac. It is a useful app that works in the background and keeps the whole history of copy, cut and paste you have done in the app. It’s a super-fast app that comes with the super simple interface to use. You can simply select multiple clippings at once. It provides five different Shelf height settings, for example, automatic, user-defined, medium, large and small. The app lets you view the originating app, originating document, and URL for relevant clippings. 1Clipboard is another one of the best Mac clipboard managers that easily lets you access your clipboard from anywhere and anytime. It is an amazing app that keeps a track of everything you copy into your clipboard across all the devices. It is built with an open-source, modern web technologies. The app synchronizes your entire data you copy and access it from anywhere on any device. It allows you to swiftly search the list of past clipboard items and copy any of them in another device. Last but not the least, flycut is a free, clean and easy to use clipboard manager for developers. Flycut is a clean and simple clipboard manager for developers. Flycut is developed by Gennadiy Potapov, which is based on open source app called Jumpcut. Like other clipboard managers, it also saves everything you do in the app like copy and paste. The app allows you to change hotkey and other settings in preferences as per needs and requirements. It allows you to safeguard your files with password protection. However, there is an option available to skip password protection, if you’re not interested. Overall, the above-mentioned apps are helps you to manage your content on the clipboard efficiently and also enhances your workflow with your minimal efforts.